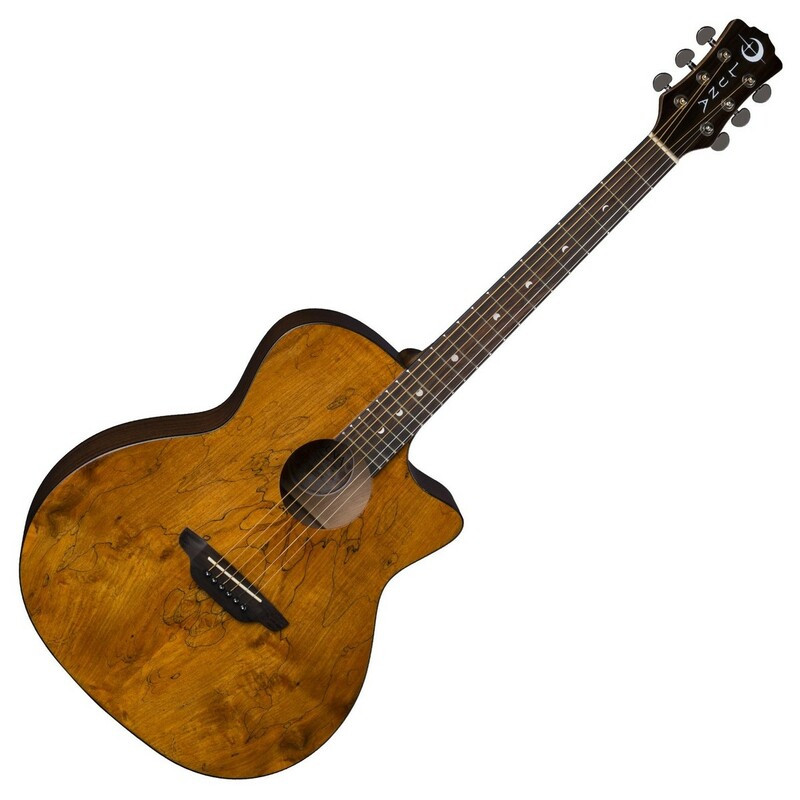 The Luna Gypsy Spalt Grand Auditorium Acoustic Guitar features a spruce and mahogany construction, which provides the Gypsy Spalt with a broad dynamic range, crisp articulation, and rich, warm, and resonant sound. Its spruce top is beautifully finished with a spalt maple graphic which embodies Luna's love for nature and uniquely creative designs. 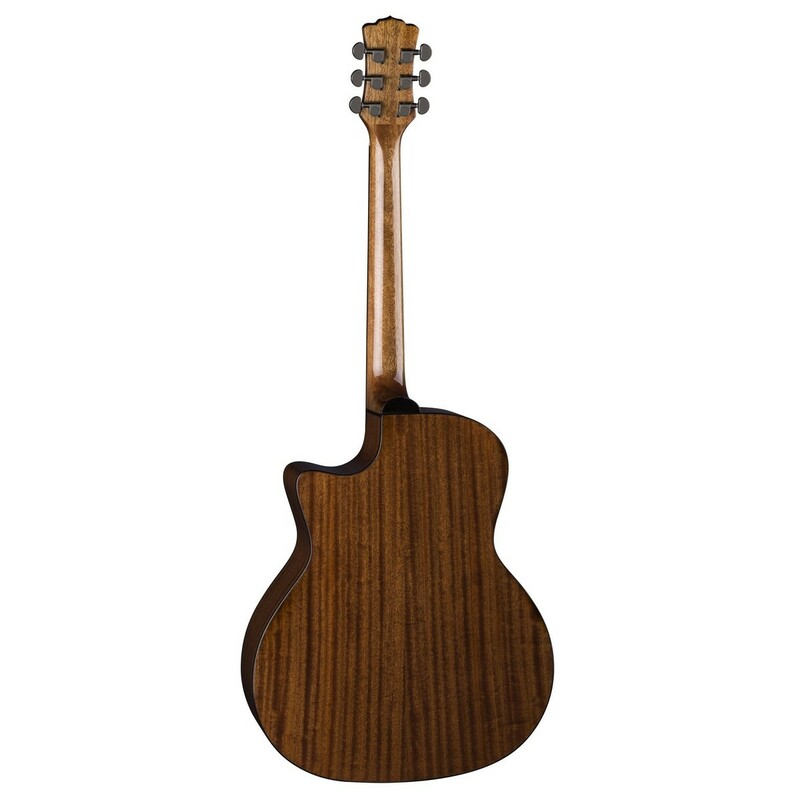 The Gypsy Spalt also features a C-shaped mahogany neck for added comfort with a rosewood fingerboard for a smooth and vibrant play. To provide a comfortable playing experience the Gypsy Spalt features a grand auditorium cutaway which is just as suited to fingerpicking styles as it is to medium-strength picking. The Gypsy Spalt's cutaway design also provides a comfortable playing experience by promoting the access to upper fingerboard shredding, offering players easy access to more challenging chords with ease. This affordable, aesthetically and sonically pleasing guitar is sure to stand out from the crowd and is ideal for the intermediate to advanced players. The Luna Gypsy Spalt features a beautifully crafted and designed spruce top, which yields crisp articulation and delivers a broad dynamic range. Its spruce top generates a versatile sound and accommodates numerous genres from fingerpicking to more aggressive strumming patterns. Spruce is quite elastic in nature, which resonates well, whilst remaining strong, and provides a focused, clear sound of deep lows, a warm mid-range, and bright sparkling highs. Its brightly toned spruce top is paired with mahogany back and sides that deliver a meaty mid-range and produces a woody, punchy tonal character that will please most playing styles. Crafted from mahogany, the Gypsy Spalt's neck provides great durability and resonance. Mahogany is commonly used to construct guitar necks as the wood responds greatly to numerous techniques with ease. To provide comfort, the Gypsy Spalt features a C shaped neck profile, which offers players a comfortable and secure grip, reducing the likeliness of a cramping hand. The neck is topped with a rosewood fingerboard that produces a bright, warm, sizzling-sparkle that really shines through when playing fingerpicking techniques. Its rosewood fingerboard also offers a smooth and energetic play, and is sprinkled with mother of pearl moon phase inlays for added beauty. 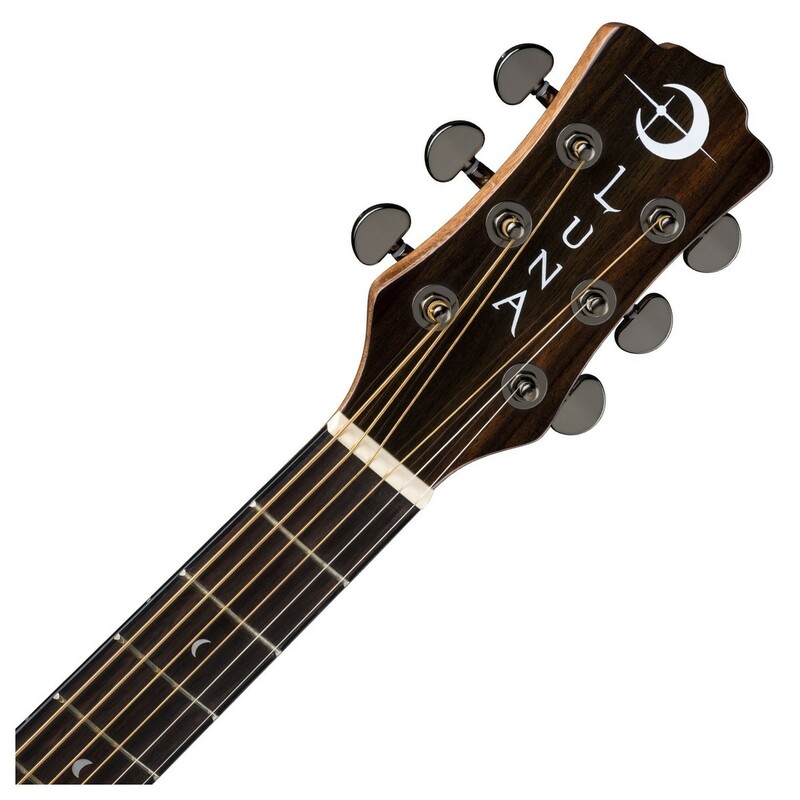 The Luna Gypsy Spalt features a grand auditorium cutaway body shape, which provides a comfortable playing experience and delivers a well-balanced sound that in well suited to range of playing styles. Its grand auditorium body is known for its versatility, as its able to accommodate both fingerpicking and strumming techniques. The Gypsy Spalt also features a cutaway design, which enables players to reach more challenging chords with ease, as well as enabling better freedom to roam up and down the fingerboard. Luna are well known for their nature-inspired instruments that were designed to engage a players mind and spirit along with their talent. 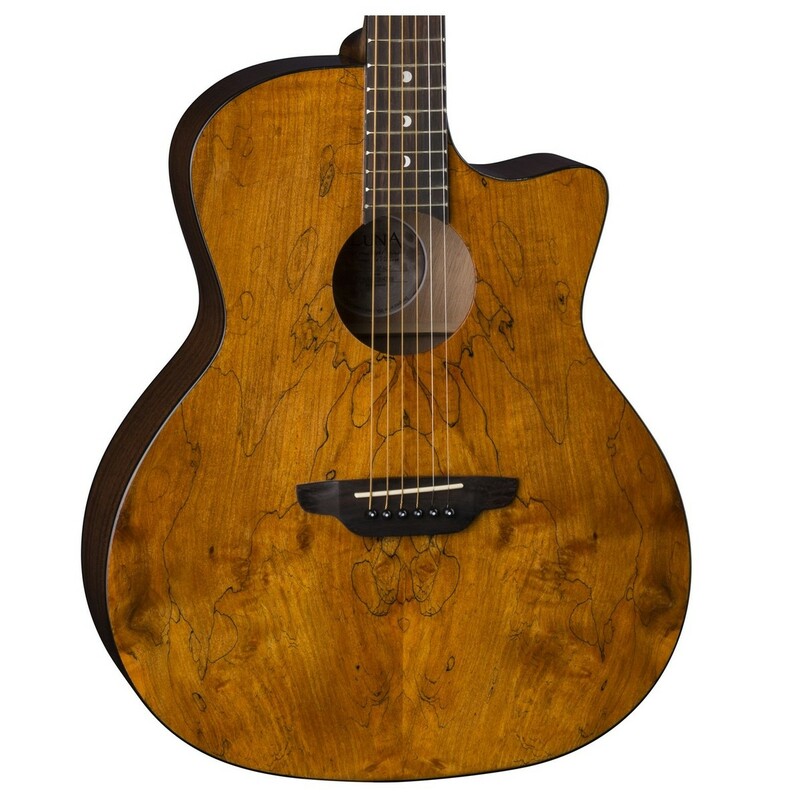 The Gypsy Spalt embodies Luna's love for nature by decorating its spruce top with a spalt maple graphic which provides a stunning, eye-catching appearance that is certain to stand out from the crowd. As well as its beautiful, nature-inspired top, the fingerboard is sprinkled with Luna's exclusive moon phase inlaid in mother of pearl, which glisten beautifully, reflecting the spirit of the moon.